The ingredients essential to calendar management include viewing existing Activities, entering new Activities, the inevitable rescheduling of Activities, and (hopefully) eventually completing some Activities. You can view your calendar from your Home Page and from your Workplace. From the Home Page, your view is limited to Past Due Activities, Activities Due Today, and Activities Due Tomorrow. The Workplace calendar has a larger selection of views and is a little more flexible. The Home Page calendar, as shown in Figure 1, shows yesterday, today, and tomorrow. You can adjust the target date by clicking the calendar icon at the top of the window and selecting a new date from the calendar that appears. If you select another date, the display shows only Activities for that day — no overdue or future Activities. 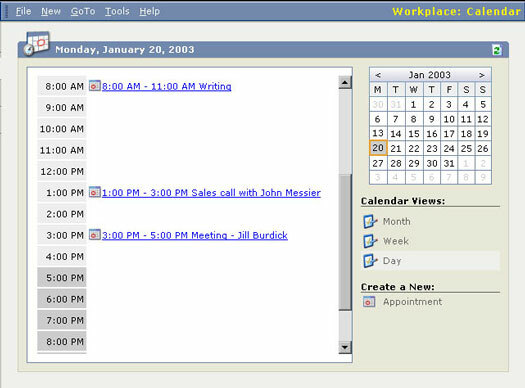 Figure 1: The Home Page calendar. You can sort all of the displayed Activities in any of the four columns in the display. Clicking the column title re-sorts all your Activities. Clicking that column title acts like a toggle switch for your sorting, going back and forth from ascending to descending order. Activities are sorted within each day’s display. Although the Home Page calendar is probably the first thing you’ll look at each time you start Microsoft CRM, the Workplace calendar has more display options and is a bit more graphical. You get to the Workplace calendar by selecting the Workplace area (an option at the bottom of virtually every screen) and then the calendar option from the panel to the side of the main display. After you make these selections, you arrive at the display shown in Figure 2. Figure 2: The Workplace calendar. The Workplace calendar shows only your appointments. Phone calls and Tasks, for example, appear in the Activity List View Grid. You get there by selecting Activities from the Workplace Side Bar. You can change the date or date range of the Workplace calendar display by selecting dates from the calendar in the upper-right corner. You also can select from three display modes (month, week, and day) from the list on the right side of the display. If you really want to know what is on your agenda, the Activity List View Grid is the place to go. You get there by selecting Activities from the Workplace panel to the side of the main display. This is the place where your day should begin, and this is the window in which you should live much of your professional life. The Find Activities field allows you to locate scheduled Activities based on the Activity Subject. Although you can use the alphabetical listing bar at the bottom of the window to locate Activity Subjects beginning with a particular letter, the Find Activity field is more flexible in that you can enter consecutive characters, such as flor, to find activity subjects starting with Florida. You can also use the wild card, to match any sequence of characters. My Activities: These are only the Activities that are on your schedule. They include past due, current, and future Activities. Open Activities: These are all open Activities, whether they belong to someone else or just to you. The default view does not, unfortunately, show to whom they belong. Closed Activities: These are all the completed Activities the system contains. All Activities: This comprehensive list displays open and completed Activities no matter whose they are. You can create an Appointment for yourself directly from the Home Page, which Microsoft online help suggests. This method is quick, but . . .
You might have problems when flippantly agreeing to some Appointment without first checking your calendar. You are always better off checking your calendar before you schedule Appointments. For that reason, you should use another approach to scheduling your Appointments when working online in Microsoft CRM. 1. 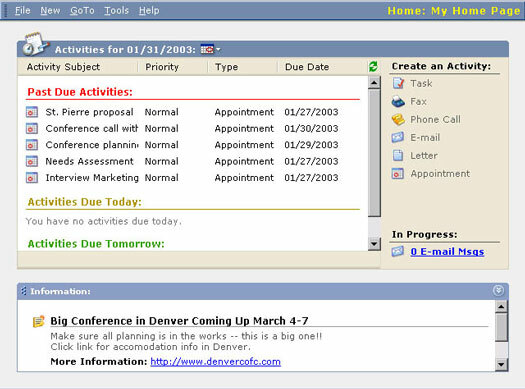 From the Workplace, select the Calendar option from the panel to the left side of the display. Your daily, weekly, or monthly calendar appears. Review your schedule here before committing to another Appointment or Activity. The calendar display shows only Appointments, not Tasks or phone calls. If you want to avoid scheduling two conference calls at the same time, consider referencing the Activity List View rather than the Calendar View. 2. Select Create a New: Appointment from the lower-right side of the window. 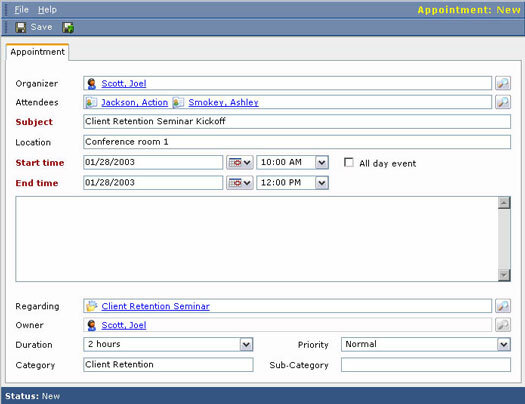 The detail form, called the Appointment tab, for entering a new Appointment appears (as shown in Figure 3). Figure 3: Entering a new Appointment from scratch. Organizer: This is the person coordinating the Activity. It is not necessary that the Organizer even be one of the attendees. This is the person you blame when the meeting is messed up. Attendees: Attendees may be Accounts, Contacts, Leads, or Users. An Account is a company, so it is unclear what it means to have a company rather than a person at a meeting. If a Lead is a company, the same issue comes up. The more common use of the Attendee field is to include Contacts (which are people) and Users (which are the people at your company). It is common to mix and match your attendee types. You probably should always have at least one Contact and one User. Subject: The text you enter in the Subject field ends up on the calendar display on the same line as the time span for the Activity. In the weekly view of the calendar, the text will wrap so you can see all the text. In the daily view, the text, if too long, may be cut off. Start Time and End Time : If you don’t enter a start and end time, particularly for Appointments, they will not be displayed on your calendar. Event: By default an event is a day-long Activity. When you select an All Day Event, you no longer have the option of selecting specific times. You can, however, specify the dates; and if the end date is different from the beginning date, you have created an Activity that spans multiple days. Vacations are a good example of an appropriate use of events. Notes: This is an unlabeled free-form text area that ultimately appears on the lines just below the time span and subject on the calendar. Regarding: This field enables you to attach an Activity to one or more Records. Those Records can be Contacts or Accounts or Leads, for example. By associating the Activity with more than one Record, you can then see the Activity from any of those Records.